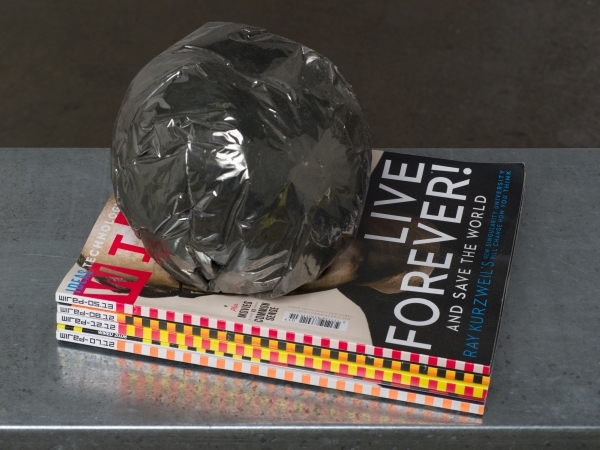 Concrete, two way mirror film, styrofoam and a stack of Wired magazines. "The technological singularity is the theoretical emergence of superintelligence through technological means. Since it is believed that the capabilities of such intelligence would be difficult for an unaided human mind to comprehend, the technological singularity is often seen as an occurrence, akin to a singularity, beyond which events cannot be predicted, yet many have made educated guesses about what will follow. The first use of the term "singularity" in this context was by mathematician John von Neumann. In the mid-1950s, von Neumann spoke of "ever accelerating progress of technology and changes in the mode of human life, which gives the appearance of approaching some essential singularity in the history of the race beyond which human affairs, as we know them, could not continue". The term was popularized by science fiction writer Vernor Vinge, who argues that artificial intelligence, human biological enhancement, or brain-computer interfaces could be possible causes of the singularity. Futurologist Ray Kurzweil, who was recently installed as a director of engineering at Google, cited von Neumann's use of the term in a foreword to von Neumann's classic book The Computer and the Brain. In 2005, Kurzweil wrote a book called The Singularity Is Near: When Humans Transcend Biology."